…turned out to be a full day on the town. David was out of the house early today, off to Bunnings again to get a drill bit to bore a hole through his brand new stand for the bench grinder / polisher. Of course we could have taken the stand we bought, back to the store and got a different one that would fit it, but that would have been easier and we never, ever to the easier thing. While he was gone I got ready to go out shopping with only one objective in mind, to get a copy of Dan Cederholm’s Bulletproof Web Design from the web development firm at the strip mall. I’ve been developing websites for over 10 years now (closer to 15) and am completely self-taught. When you get to where you are without any real reference it is true to be said you do it the way to get things done, not necessarily the absolute right way. People have been raving about this book since it was release some time ago… so I thought I’d finally bite the bullet and realise that perhaps I could learn something new. Turns out (from what I’ve read so far), rather than new, I’m learning different ways to do stuff. Alternatives if you will. I’ve always coded to the standards set by the W3C so I know that there was nothing I was doing wrong… but not all browsers are developed to these standards… (bloody Microsoft) and the hacks I’ve put in place to accommodate in the past are clunky and more time consuming that they had to be (according to this book). I now look forward to a lot less code when I create a page. 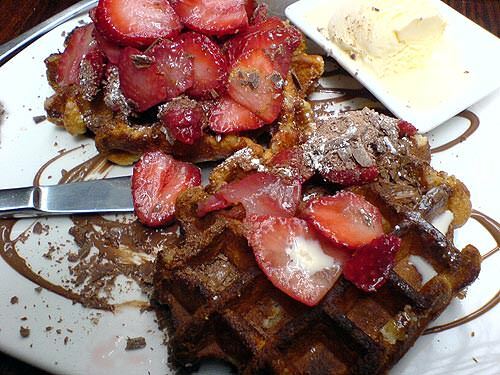 We also stopped in at Max Brenner at Melbourne Central… the better of the two Max Brenner stores. When you have a hot chocolate at the Melbourne Central store, it is like pure liquid chocolate… very decadent. At the Highpoint store they use SOME liquid chocolate and a whole lotta syrup. Actullay earlier in the day I had my first try of “Lord of the Fries” in Melbourne and on them we had Belgian sauce… a very Belgian day. The only bad thing about Max Brenner, is they charge a 10% surcharge for weekends and public holidays. Public Holidays I can kind of understand… but weekends c’mon guys surely that’s when most of your business happens, can anyone say extortion? Honestly I am being more careful with what I eat these days, but a little splurge now and they won’t kill anyone. As for the junk food, it’s the weekend for it. Our poison of choice was hot cinnamon donuts, which we made the Donut King girls cook specially for us, no way were we going to be convinced that the donuts already there were acceptable. Anyway, hope you guys are having a great weekend, we’ve missed seeing you around. max brenner in melb central is definitely the better one out of the two city stores, but the service varies heaps. i swear they employ some of the dopiest chicks at that place, but hey, nothing beats their chocolate. yum!